It’s that time of year again. The air is crisp, the leaves are fallen, and we’re done handing out candy to the cute and spooky trick-or-treaters. It’s time to change our clocks back an hour and get another glorious hour of sleep! Or do we? Whether you're someone who can grab that extra hour or use that extra time to get more done with your day, we all can learn what our unique sleep needs are. Our body is here to tell us what we need if we try a few simple things and then take the time to listen. I had the opportunity to see Dr. Michael Breus at this year’s Bulletproof Biohacking conference and want to share some of the great sleep advice he provided. I don’t have an explanation for all the information he shared, but I’m confident that it’s all laid out in his book; The Power of When. Dr. Breus talked about our chronotype, which is a defined sleep type based on the behavioral expression of underlying circadian rhythms of multiple physical processes. In other words, how we show up in the world is tied to our sleep style. Go to The Power of When Quiz website to learn if you're a dolphin, wolf, lion, or bear chronotype. You'll get information on what that means for your sleep style and get some good tips on the best times to eat, nap, have your morning coffee and other tid-bits. There is so much information to share about sleep, the cycles, when you dream, how to calculate YOUR best time to go to bed, and so much more, but that makes this article a much longer read and I just want to give you some quick and helpful information. Dr. Breus has a lot of useful material available on his website including a logical way of calculating your unique sleep needs. I highly recommend spending a little time learning how to hack your optimal bed time. Here are some simple tricks to help you get better sleep from each of your five senses. Light affects your biological clock and melatonin production. Specifically blue light from energy efficient lightbulbs, computers, tablets, smart phones, and other electronics can literally turn-off melatonin production in the evening. Here’s a great Harvard Medical School article on the ‘dark side’ of blue light and it’s impacts on our sleep and overall health. They found that too much blue light and/or too little sleep are linked to a greater risk cardiovascular disease and depression, among other diseases. Get night-specific light bulbs that remove the blue light wavelengths or can turn red. Put dimmers on your lights to take away that burst of light when you flip the switch and keep them dimmed low in the eveining. Get a pair of blue light spectrum blocking glasses to wear 1/2 to 1 hour before bed. Limit screen time. It’s one thing to watch TV from across the room but staring into your laptop, a large monitor, a tablet, or your mobile phone stops melatonin production. Install this awesome free software, f.lux, on your computer so it naturally dims the screen. I already have dimmable and color-changing bulbs in my home but I also recently started wearing True Dark Twilight red lenses and found them to be pure magic! My husband finds it hilarious that I need to put my readers on in front of my Twilights to read, but it’s making a measurable difference in my quality of sleep and ability to stay asleep. I’m all in for a good laugh at my expense if it means a better night’s sleep! It’s not uncommon for those of us living in the foothills of Colorado to wear earplugs, especially during the windy season. There’s a reason why the National Wind Technology Center is just up the road from us. We can get house-shaking bursts above 100 mph making a good night’s sleep near impossible at times. Investing in inexpensive earplugs with an NRR of 32 or less will knock noise down by 30dB (decibels), which really makes a difference. For those of you that use an alarm clock every morning and slap that snooze button multiple times. It’s not only pointless, it’s not serving your body. Since snooze lasts around 9 minutes, you are only getting light and lousy sleep. It’s best to just get up or set your alarm for a later time. Or, better yet, use Dr. Breus’ sleep calculator to determine what time you should be going to sleep. One last note on sound, studies show that using a sound machine with rolling ocean waves helps with both falling and staying asleep. The reasoning is that the brain interprets the sound as non-threatening. I guess I’ve tested this one first hand because I sure sleep better when I’m on vacation in Hawaii! Quality and quantity of sleep is also related directly to your mattress. It’s worth the time to find one what works FOR YOU. 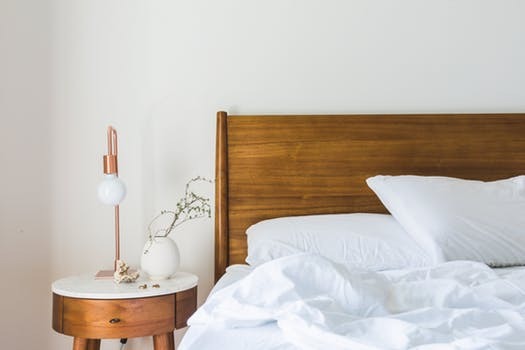 If getting an all natural or organic mattress that doesn’t off-gas toxic chemicals isn’t in your budget, store your new mattress in a separate room with open windows and a fan blowing across it for a minimum of three days or up to a month. However, if you do need to put it in your bedroom right away, consider sleeping in another room or on the couch to let that room and the mattress air out for a few days. While some chemicals in mattresses have an odor, other’s don’t. So, just because you don’t smell it anymore doesn’t mean your new mattress isn’t gifting you with a cocktail of chemicals. Mattresses can off-gas chemicals for many months and I understand that we really need the new mattress when we buy it, but I implore you to give it some breathing time before sleeping on it. We’ll dive right into what we can do to improve our sleep when we enjoy these festive tastes. But note, no matter what you do the night before, always drink 16oz of water soon after waking due to the natural effects of dehydration from a full night’s sleep. It doesn’t matter if you're male or female, aromatherapy can bring on a relaxation effect to help you fall and stay asleep. Add essential oils to a bath, use them in a diffuser, or put a few drops on a warm compress. If you haven’t fallen asleep yet, thank you for reading to the end!! Dr. Breus covered much more information at the conference but I wanted to share some specific and easily actionable nuggets of wisdom with you. One final piece of advice. If you find your energy dropping in the early afternoon, it's most likely due to the natural cycle for your body temperature to drop and melatonin production to increase. If you can’t or won’t take a nap, go outside into the sunshine without your sunglasses and a jacket. Take in the rays for a few minutes to stop the melatonin production and naturally increase your energy. That should get you going again. Good night, sleep tight and don’t let the bed-bugs bite!